When the Formula 1 season ends, the wider public probably believes the teams can have a few weeks' well-earned rest. Nothing could be further from the truth. 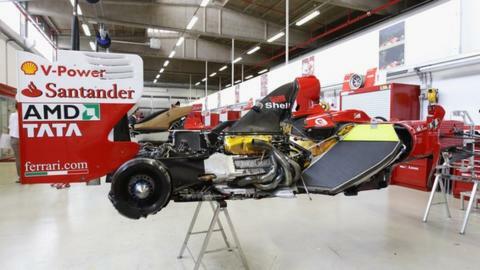 Since long before the final race of last year in Brazil, all the teams have been hard at work on the car they will be campaigning with in 2013. That work, already deeply concentrated, takes on a new level of intensity once one season has been dealt with. In the weeks leading up to the first pre-season test, we will be giving you an insight into the long, complex and intricate process that leads to a new Formula 1 car hitting the track in Spain in early February. First of all, we will examine the first steps in the design of a new car. And it might surprise you to know that the work on the cars you will see for the first time in the next month or so started as soon as their predecessors hit the track at the same time last year. When a team starts testing with a new car, they are trying to identify the weaknesses you can't fix by introducing a 'B' version later in the season - the big weaknesses. You have to identify what can be tweaked and made better during the season, but at the same time bigger things you cannot change but will want to be different on the next car. An engineer might realise that if the gearbox was a bit smaller at the bottom, he could design a better diffuser and improve the rear aerodynamics. He might realise that if the 'keel' area - the chassis under the driver's legs - was further forwards, or back, or higher or narrower, that also could improve the aerodynamics. So the notepad you see the likes of Red Bull chief technical officer Adrian Newey wandering around with at the tests, that's what it's full of - problems. That process is the very start of the initial packaging of the car that will race the following season. The minute a new car sits on the ground the first time, you immediately have a 'do it now' list, for updates for the current car, and the start of a 'do it next year' list. Both of those will get added to as time goes on. And by the beginning of July the 'next year' list wants to be put together on a specification sheet that outlines the objectives of the new car. It's about getting the concept right at that early stage - the detailed aerodynamic performance work comes later. The concept work is very important, because it is what takes time to sort out - so it needs to be right when you start to put the new car together in January. The sort of areas of the car we're talking about are fundamental suspension design, fuel-tank size, gearbox size and design, Kers size and positioning and so on. The aerodynamic package, the suspension geometry, the packaging of dampers and so on will all come out of that major packaging concept. Once you've made these calls, you put a certain percentage of your team of people onto the new car, at around the beginning of July, to start to scheme it all up. They can then hand a package to the aerodynamicists so they can start to optimise the bodywork around it. For 2013, this is not such a big deal - the regulations are staying pretty stable so it's about fine detail changes. But even then there can be big decisions to make. An example would be the fundamental suspension layout. Last year, Ferrari uniquely used pull-rod front suspension for aerodynamic reasons. I suspect two or three other teams will try that this year. But you can't do that during a season. It is a packaging issue, because it means moving the dampers and torsion bars to the bottom of the chassis from the top - so it has to be put down on the initial layout of the car. Another would be whether to follow Williams in producing an ultra-small gearbox. A team will look at these things and try to work out whether there are big advantages to be had or not. Where it gets complicated is that these fundamental mechanical parts of the car go hand-in-hand with the aerodynamic detailing. For example, you will be looking at your diffuser and how it joins up with the gearbox. This is a very critical area for aerodynamic performance - as you can see on last year's Red Bull with the ducts feeding airflow through from the side pod area into the central section of the diffuser. So the aerodynamicists will be coming to the guys laying out the overall car saying: "We can do this and make the car function better than what we have now but mechanically, can it be packaged?" It's the aerodynamic side that gives you lap time. The mechanical side, generally, only lets you down. It loses races; the aerodynamic package is what wins races. The two have to complement each other, but the packaging of components such as the gearbox design, suspension, keel, and so on are fundamental to producing better aerodynamics and allow more room for development. But you have to start the gearbox, chassis etc first because they are the items with the longest lead-time. Even for the best teams, you're talking 12 weeks from pressing the button on a chassis build to having a completed chassis. Where does the downforce come from? The low, wide front wing and the tall, narrow rear wing contribute roughly 60% of the car's downforce, with the other 40% generated from underneath the car by its floor. The first test is in early February, you want to be building the car up during January. So you have to be starting to build your chassis and gearbox in the middle of September. So you're working forwards and backwards at the same time - backwards from the first test and forwards from the initial proposals for the car. Once a team has built a new chassis, the team have to do all the crash tests before they can go testing. To ease that process, they will set up a parallel programme - the first chassis will go and get its impact tests done, and the second will start to be assembled. Equally, you can't go to the first test with only one gearbox, you have to have two or three in case there are problems. That's why these things need to be built first. They are the spine of the car. If you don't get them done on time, you have a problem. Equally, the way you design them can have an important effect later in the season. We saw that in 2009, when the double-diffuser dominated performance. Only three teams designed that into their cars from the beginning. Of the rest, who needed to add it later once it was declared legal, some teams' gearbox packages worked well with a double diffuser and some did not. Ferrari were one of those teams whose gearbox would never have allowed them to optimise a double diffuser. They considered building an entirely new gearbox but decided it was not worth building one because by the time it was ready too much of the season would have gone and they would have lost too much ground in the championship to recover. So their season was effectively written off by April or May. That's how important it can be to get the basic design right from the start.